You know how people always joke that as soon as an appliance or expensive piece of equipment goes out of warranty, it’ll break? Almost as soon as the warranty ended on my sweet little MacBook, it began malfunctioning. Of course, the MacBook hasn’t had an easy life. I do have a toddler and I am a klutz, so it has been a victim of gravity a few times. I’d be willing to bet, though, that the very day the warranty ran out was the day it really started showing the worst problems. For months now, it seems that the battery has run out just as quickly when it’s shut and sleeping (not on the charger) as when I’m using it. I thought that was a power settings issue, or just a quirk of this model of computer. A few weeks ago–ironically, the first day we finally got internet at the new house–it began to shut itself off when not on the charger. No low-battery warning, no nothing. It was kind of random, too. In the next few days, it progressed to where the computer was not sensing the battery at all (the fully-charged battery, which, when I was using it before, had a good two to three hours left on it–definitely not a “dead” battery). I should have called Apple that day, or the day after. The computer might still have been under warranty. However, it was still such an intermittent problem that it didn’t occur to me to get support just then. I finally called yesterday, because I finally had a good chance to. I knew the computer was no longer under warranty, so I thought I’d just deal with whatever it would cost me to call in. Fortunately, it didn’t cost anything (that I know of . . . yet), and it’s a good thing it didn’t, because the guy was not helpful at all. (Just FYI: This is not a complaint about Apple support in general; we usually have very good service with them. This guy was just . . . not helpful to me.) Of course, not actually looking at my computer, he couldn’t really deduce what the problem might be, so he naturally assumed I had a dead battery, and that was my problem. I tried to tell him that, no, the battery was far from dead and I believed it was a contact issue–the computer just wasn’t registering a battery installed. We went around in a circle a couple times, then he offered to make an appointment at a “local” Apple store for me so I could take it in to get looked at. As soon as I heard that, I knew we were going to have a problem. As far as I knew then, the closest Apple stores were in the Seattle vicinity, which was either a one- to two-hour drive or a half-hour drive and one-hour ferry ride away. When he told me the closest one was in Southcenter, I was a little happier, because that was a little closer than I’d thought–only an hour and a half, depending on traffic. Only problem: I’m within weeks of giving birth, and I’m not really supposed to travel that far away. (That sounds like a funny rule, but my first child’s birth was FAST, so I’m not taking any chances!) I told the guy that and asked him for the phone number so I could call at my convenience. 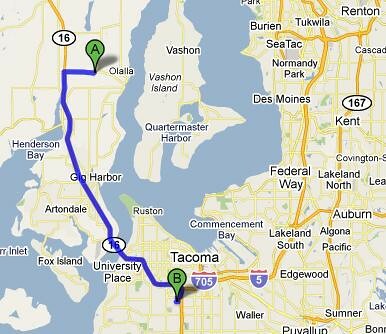 The guy sounded a bit perplexed that I would pass up the opportunity to go to an Apple store “only fifteen miles away”. Heheh. Yeah, if you’re not a native to the area, and not actually looking at a map, (or you’re Superman,) you would think that Southcenter was only a hop and a skip from my current location. However, there’s a body of water and an island in the way, and no direct ferry ride across. 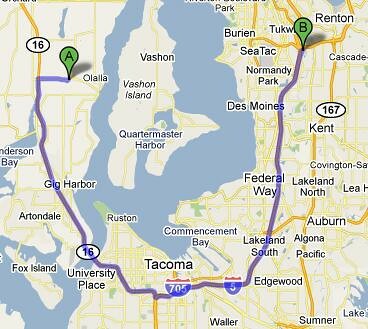 If you want to get to Southcenter, you drive the 40+ miles it takes to get there. It’s a problem that comes up all the time when searching for “local” specialists, doctors, etc. I remember trying to find a specific type of doctor through the TriCare search engine, and the most local ones found were in Burien (right next to Southcenter). Only 19 miles away from where I was! 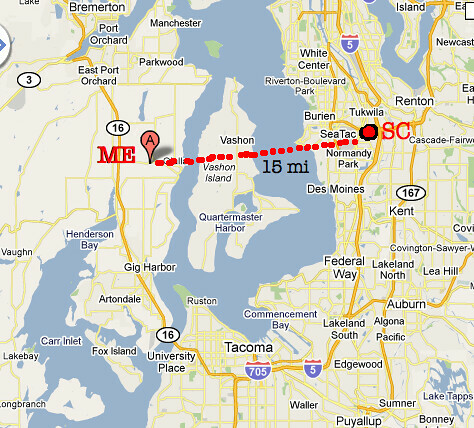 That’s closer than the 20+ to Poulsbo, right? It’s not their fault, it’s just a quirk of the area. It can make communication difficult, though, especially if you’re dealing with someone who wants to set you up an appointment with someone “local” over the phone, but they know nothing about the area you live in. I think that’s how I ended up seeing a counselor in Fremont (north of Seattle) when I lived in Bremerton. LOOONG round trip; expensive, too. So, hopefully, I can get this thing fixed in a more timely fashion, because a trip to the Tacoma Mall is not nearly as inconvenient as a trip to Southcenter. Especially if I have to leave the computer there for any length of time, which makes me horrifically nervous. Time to do some backups . . .
Next Post SPEAKING of INsomnia . . .